This book was fantastic! Each chapter is dedicated to a different well known monster: Frankenstein, Vampire, Bigfoot, Zombie, Werewolf and Sea Monster, and for each of them the science, and also historic and cultural backgrounds, are analyzed in order to try to figure out if their existence could be possible. As an example, in Frankenstein's chapter (which is also my favorite) the reader will find the story of when Mary Shelly wrote the first draft of the novel, the Enlightenment as the background, what is electricity and if it really can wake the dead, neurons, organ transplantation, genetic engineering, monsters as lonely creatures, mad scientists, body snatchers, and more. Going through all the six chapters you will read about an incredibly amount of topics such as blood diseases, scientific revolution, metamorphosis, hypnosis, species classification, evolution, plagues, hybrids, Sonar, Tsunamis, and an endless etc. The text is accessible for the age range, and the book is thoroughly illustrated with funny pictures, not scary at all. 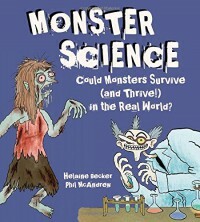 Most of the kids are interested, or at least curious, about monsters, and Monster Science is a great option to stimulate their interest in science.